Sometimes we make plans and life intervenes. Sometimes these plans are for two months of travel over the summer - plans that have unfolded in the same manner every summer for 10 years. Completely unraveled. So, here I sit in my house in the same spot I sit every other morning of the year while my husband does the traveling without me. The reason is not insignificant - you do what needs to be done. That doesn’t mean there is no disappointment or sadness or grief. It just means that priorities are best kept in order and in this case it was the right thing to do. So, here I am, eating frogs and drinking lemonade. Frogs include such things as doctors appointments and difficult work projects. This blog post is a frog. I have been procrastinating on writing and posting - using distractions and mundane tasks not to post, not to write, not to make. An example of lemonade can be found in the picture you see here. Our Hydrangea bush - since we are gone every summer, I have never seen it in its full glory. This year it is loaded and blue. 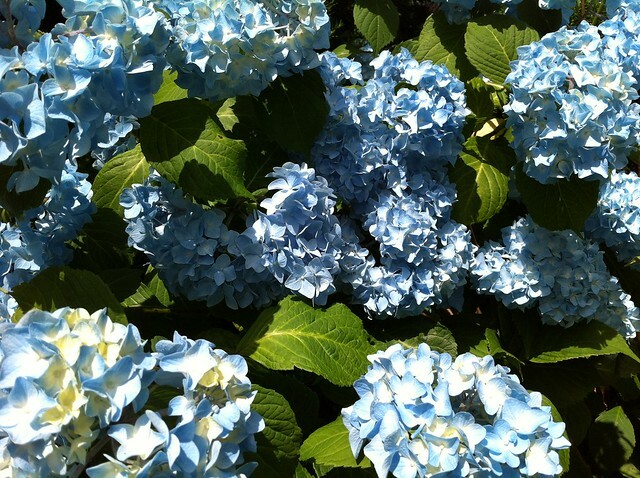 I will have fresh cut Hydrangeas for as long as they last. Pardon me, while I take another sip of fresh lemonade.